Thoughts from a Traveling Tech: Is this a sign of new technology? We get a lot of hail and other flying debris around here and so over the years I have seen more than my fair share of vehicles with windows covered with plastic and taped in place. I have seen tape used to repair taillights and hold body panels on cars. But this is the first time I have seen this. As the wife and I were exiting a local supermarket we saw this car parked in the lot. My first thought was that they had problems with their gas panel. But that led me to wonder how they planned to put gas in the car if the gas cover is sealed shut. Then I hit upon it... this person has outfitted this PoS with cold fusion energy! They were driving this vehicle without the expensive cost of gasoline. This had to be the solution I was looking for. They were testing a new form of energy generation to power vehicles and put it into a beater car to make it less obvious. 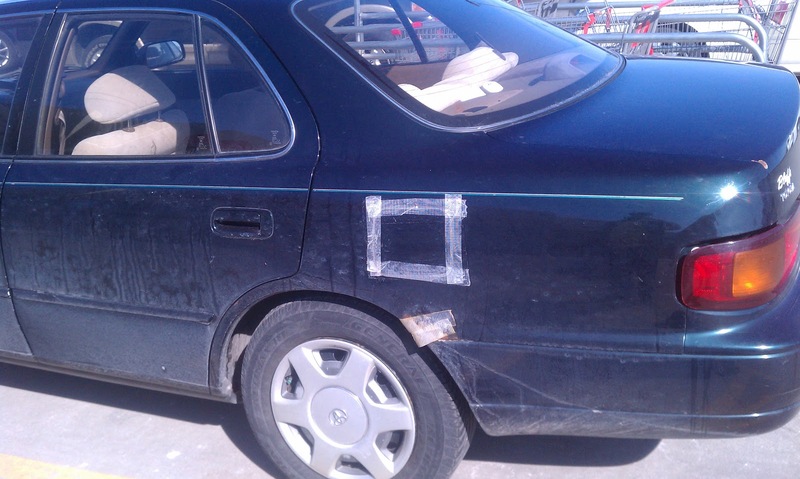 Too bad they made the mistake of taping the gas cover, that gave it all away. That or they are really not thinking this tape job through.